, the vendor of smart developer tools such as IntelliJ IDEA, PyCharm, PhpStorm, Android Studio and many more. We build tools that enhance developer productivity and code quality. We do this by providing plugins that support integration with databases, frameworks, and services, such as Google App Engine. In this post, we will look at how we’ve made it easier to deploy to Google App Engine from PyCharm or IntelliJ IDEA. PyCharm Professional Edition comes with Google App Engine Integration built in. 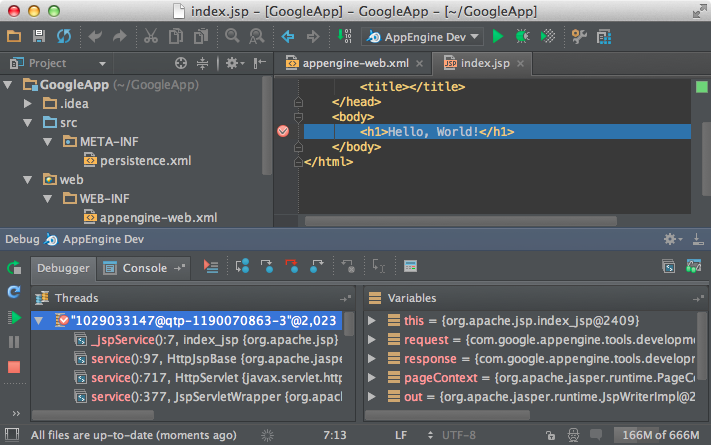 For IntelliJ IDEA Ultimate you need to enable it by installing the Google App Engine Integration plugin. Once integration is enabled, you can create a new Google App Engine application, open a sample shipped with the Google App Engine SDK or open an existing project you may have. The IDE will ask for some additional information, such as the Google App Engine application id. Once that is done, the IDE will create a new project structure in which you can start working. All the various coding assistance features in the IDE are available: syntax and error highlighting, automatic indentation, code completion and more. The Google App Engine SDK directory is automatically added to Libraries in your IDE so all the APIs and classes will provide autocompletion. The IDEs also offer code inspections for common problems and issues in code. 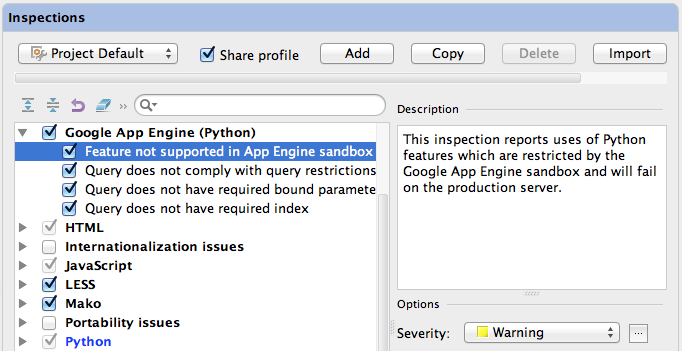 For example, PyCharm features some inspections that report the use of language features restricted on GAE and so on. IntelliJ IDEA provides similar inspections. During development, you can run your application locally without having to upload it to Google App Engine. The IDE provides a special run/debug configuration that launches your application locally. Once started, you can navigate to it in your browser at the http://localhost:8080 URL, by default. The Run tool window at the bottom of the IDE will show the output of the GAE application server you launched locally. If instead of using the Run button you use the Debug button (or Shift+F9), the IDE attaches a debugger to your application server. You can now add breakpoints in your application and inspect variables and so on using the Debug tool window once a breakpoint has been hit. Once you feel your application is ready to go live, you can deploy it to Google App Engine Appspot. From the Tools > Google App Engine > Upload App Engine app menu, you can trigger the upload. This will open a new tool window in which you enter your Google Account credentials. The IDE will run the appcfg.py tool and display the output. Once the upload and deployment is finished, your application will be live. Congratulations! 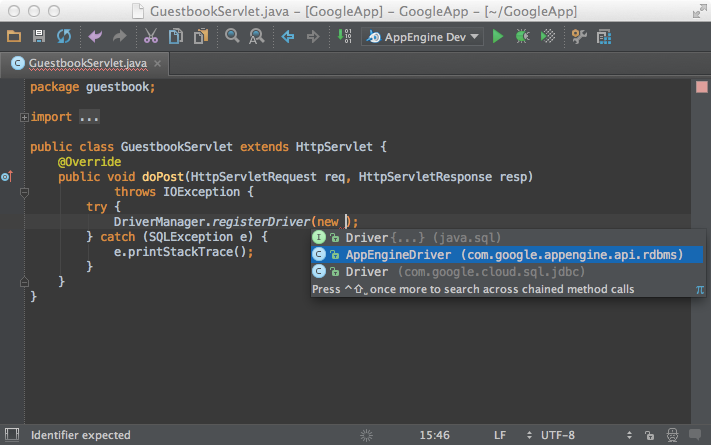 As you’ve seen in this blog post, the Google App Engine integrations for IntelliJ IDEA and PyCharm enhance our tools by adding a local test Google App Engine development environment, debugging support and more. We’re not stopping here though, so keep an eye out for even more added functionality. We have some detailed tutorials available for Java and Python. Give it a try (trial versions are available for IntelliJ IDEA and PyCharm) and let us know your thoughts through the comments below. Today’s guest post comes from Maarten Balliauw, Technical Evangelist at JetBrains, the vendor of smart developer tools such as IntelliJ IDEA, PyCharm, PhpStorm, Android Studio and many more.